Within the North Shore are the City of North Vancouver, District of North Vancouver and the District of West Vancouver. This area is situated between the North Shore Mountains with recreational activities year-round. 8km (5miles) north of downtown Vancouver is North Vancouver. Access is via Highway 99 over the Lions Gate Bridge or Highway 1 over the Second Narrows Bridge. 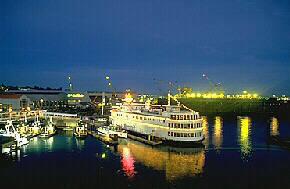 A city since 1907, the North Vancouver port is one of the most active in the area. This pleasant area offers shopping, restaurants, a waterfront park as well as attractive living areas. It is located at the foot of Lonsdale Avenue next to the Sea Bus Terminal. Made of wire rope and wood this is the longest suspension bridge in the world. It is located at 3735 Capilano Road. The skyride to the top of Grouse Mountain offers an excellent view of the city's skyline, harbour and Georgia Strait. Grouse is the earliest developed ski area in this region and offers a dozen different ski runs and night skiing. It is popular for hand-gliding during the summer months. Declared an industry free zone in 1925, this beautiful area is bordered by Burrard Inlet to the south and the Howe Sound to the west. 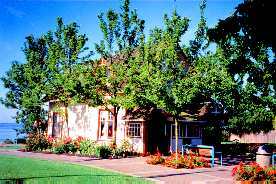 It is comprised of four villages including Ambleside, Dundarave, Caulfield and Horseshoe Bay. 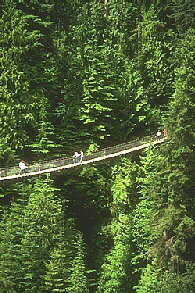 Access to West Vancouver is via Highway 99 across the Lions Gate Bridge or the Second Narrows Bridge and Highway 1. Located across from Stanley Park just off of Marine Drive this park offers pleasant sea walks and beaches. This wilderness area is located on the mouth of Burrard Inlet, just off of Highway 1/99 on Caulfield Drive and offers excellent views of English Bay is Stanley Park and Vancouver. There are good hiking trails through the rain forest. Part of the Coast Mountain chain, Cypress Mountain offers excellent views of the city and good downhill and nordic skiing, snowshoeing trails and hiking in the summer. Horseshoe Bay: Situated on the Howe Sound, just off of Highway 1/99, this is the terminus for B.C. Ferries traveling to Nanaimo on Vancouver Island and to the Sunshine Coast.